OCTOBER 2014, HIGH POINT, NC - The iconic beach city of Malibu is the home of glamorous celebrity mansions and sleek architecture, as well as beautiful coastal cliffs, hiking trails, and sun-drenched, sandy beaches. This dichotomy of urbane sophistication and a casual beach lifestyle comes to life in the new Malibu Collection by Marge Carson. With its simple, elegant lines, Malibu combines accents of natural shell and stone with stainless steel and polished nickel hardware to create a soft-edge modern look. The mixed media contrast of organic and sleek materials is on trend with the international design stage. At the recent Maison Objet Show in Paris, for example, unexpected mixed media combinations were prominent. The 39-piece Malibu Collection, including 10 pieces of occasional and 18 upholstered items, is inspired in part by Mid-Century Modern influences, and by the work of Dutch painter Piet Mondrian, known for artistic grids of vertical and horizontal lines. Crafted of plantation-grown white teak solids and cherry veneers, Malibu's primary finishes are Contemporary Havana, Bombay and Kona. The finish combinations, like the mixed media combinations, present the contrast of a deep, rich, warm finish and a glamorous silver leaf finish. Six different shell inlays are available for Malibu including Pearl, Raven, Pewter and Honey, available polished or textured, and Silver Mosaic and Leopard, available for limited use.  Stone inlay choices include Camel, Crystal Alabaster, Crystal Taupe and Crystal Beige, available polished or textured. With soft, curvaceous lines and a mixture of sleek sparkle and casual organic materials, the leading-edge Malibu Collection is current with today's new look of modern glamour in home fashion, and with the contemporary, creative and clean direction of architecture and design today. 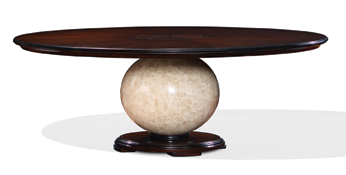 An elegant take on contemporary, the round dining table balances a cherry veneer patterned table top with ebony trim on a spherical base that is offered in any of the polished or textured shell or stone material finishes. 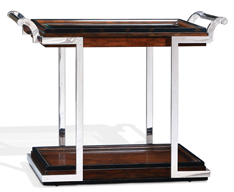 Tabletop is available in 84-inch and 72-inch diameters. 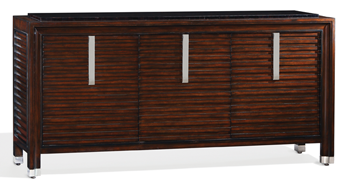 Shown in the Contemporary Havana finish with Ebony trim, horizontal slats are bisected by polished nickel hardware matched by silver ferrules at feet. The top is inlaid with stone or shells of your choice. The Malibu nightstand is a mixed media delight. The piece combines textured Raven shell inlay on the drawer faces and a cherry veneer top contrasting with the Contemporary Havana finish with ebony trim. The punctuation mark is square-shaped polished nickel hardware with a shagreen-like texture. 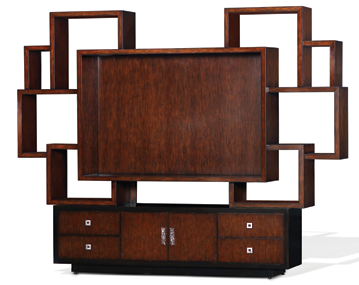 With a dramatic contemporary floating effect in an interlocking grid design, the Malibu entertainment wall unit is a striking and warm focal point for any room. The unit accommodates up to a 70-inch flat-screen TV, and the open shelves are perfect for accessories and books. Wires are invisible when routed through the lower posts beneath the TV mounting area. 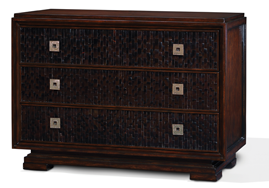 Shown here in a two-tone finish combining Contemporary Havana and Ebony. This unique and functional kitchen and dining piece is characterized by a stainless steel frame and handles. It features a glass top shelf, and the cherry veneered lower shelf has castors beneath so the piece is easily moved from one room to the other.